Sciblogs | Homeopathy Awareness Week: how do you approve a course for something known not to work? Homeopathy Awareness Week: how do you approve a course for something known not to work? Homeopathy uses solutions diluted until the active ingredients are no longer present—water basically—to treat illnesses. The premise of homeopathy is so absurd, it opens itself to parody. More seriously, homeopathy has been examined and found to be ineffective with several formal reports saying so. Fellow blogger Siouxsie mentions one such report from the Australian National Health and Medical Research Council. Similarly, the British House of Commons Science and Technology Committee’s report Evidence Check 2: Homeopathy gave a very firm “no” to homeopathy. Some of you will probably be more or less troubled by the pretensions of that parody of mediaeval theology which finds its dogma of hereditary depravity in the doctrine of psora [homeopathy], its miracle of transubstantiation in the mystery of its triturations and dilutions, its church in the people who have mistaken their century, and its priests in those who have mistaken their calling. You can do little with persons who are disposed to accept these curious medical superstitions. The saturation-point of individual minds with reference to evidence, and especially medical evidence, differs, and must always continue to differ, very widely. There are those whose minds are satisfied with the decillionth dilution of a scientific proof. No wonder they believe in the efficacy of a similar attenuation of bryony or pulsatilla. You have no fulcrum you can rest upon to lift an error out of such minds as these, often highly endowed with knowledge and talent, sometimes with genius, but commonly richer in the imaginative than the observing and reasoning faculties. Modern statements that homeopathy is no better than placebo offerings are backed by studies. You might think that this would lead to no standards bodies approving courses teaching it. However, in New Zealand the NZ Qualifications Authority (NZQA) approves courses in homeopathy. A question, then. How do you approve a course in something that is known not to work? Known not to have therapeutic value beyond a placebo effect. If you search the NZQA website for ‘homeopathy’ you’ll be offered five pages among them listing courses and institutes that they have approved. As one example, they approved a ‘Certificate in Acute Prescribing with Homeopathy’. You don’t have to be a medical practitioner to realise ‘acute prescribing’ of homeopathic remedies makes little sense. Elsewhere I have argued that homeopathic remedies should not be present in pharmacies. Should courses in homeopathy not be formally approved by NZQA? You’re welcome to offer your thoughts in the comments below. My feeling is that veneers of respectability and soundness ought to not to be given to practices like this as it may give consumers the misleading impression that the treatments ‘must’ have some merit if a formal accrediting agency has put their weight behind the courses teaching it. Thanks to Alison Campbell for bringing the NZQA approval of homeopathy courses to my attention. 2. Some seem to use alcohol as the solvent, in which case you might just as well take a nip of your favourite (strong) alcoholic drink. 3. The mixtures are, apparently, shaken between each serial dilution. 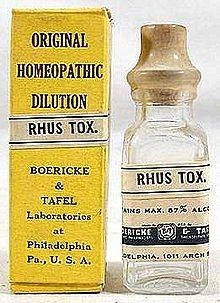 My recollection is that this originated from a variant of his remedy that Samuel Hahnemann, the ‘inventor’ of homeopathy, introduced to help sell his remedy where a strong brand of Christianity appealed to faith healing. This variant was to whack the mixture against a bible after each dilution so that the power of the good book might enter the remedy. (Or so the sales pitch went.) The (few!) homeopath websites I have viewed made no mention of a bible but do mention shaking the mixture. 4. There are many other examples; this one isn’t by any means the best but I hope it gives readers the general idea. 5. I like the allusion to Archimedes, although I suppose you could say it really wants ‘nor a lever long enough’ added to it, rather than (just) the size of the fulcrum. 6. We could also look at other things NZQA approve such as courses in such as naturopathy and so on, but let’s stick to homeopathy for now. They have a section ‘Complementary Therapies’. It adds undeserved credibility to homeopathy to associate it with a qualification, and that credibility undermines a customers understanding of what they are paying for. It also makes me wonder what is the point in having a good mark or a bad mark in a homeopathic course – either a good mark correlates with a good student, who then is as effective as a placebo, and a bad student is also as effective as a placebo, in which case there is no point. Alternatively, a good student is as effective as a placebo, but a bad student is worse, causing harm relative even to a placebo. I like you point about students, testing and the placebo effect – very astute. I presume they’re tested on rote learning – ? As you say there’s no real way to mark them on successfully treating patients, as the remedies are no better than a placebo effect. In making a homeopathic product the active ingredients are diluted out of the product and are not present in the final product. Two homeopathic products using the same solvent (water, alcohol) and different ‘active’ ingredients would end up the same, since in both cases the active ingredients would be diluted out leaving only the solvent. I wondered if there were anything other than solvents, binders etc, can you claim the remedy is contaminated? Darcy – I was going to link to that! … which also makes me wonder, what is the point of having different remedies? Of course homeopaths say it is the succussion that potentiates the water, but without any evidence or motivation for it, it seems like something someone just daydreamed up one day. Nice to be able to do anything you like, huh? Are the NZQA courses and standards for maths, science, history etc equally inappropriate? What does this say about NCEA standards? You want to look at each on their own merits. What whatever is true for other things (for good or bad), it wouldn’t undo the silliness of them backing homeopathy courses. (They also back other ‘complementary medicine’ that has similarly dodgy claims to working for that matter.) And vice versa that they back homeopathy courses, doesn’t make whatever else they do ‘wrong’. Judge each call on it’s own merits, I think. @Elaine – the subject of this blog is accrediting something proven not to work. How does that parallel in any way with maths, science, history etc? Aha! Business and successful! Money! So, lets say you didn’t pay for the treatment from a medical doctor and you didn’t pay for treatment from a homeopathist. Then I bet my house the medical doctor will have a significantly greater (read practically always) treatment success rate AND satisfied clients than the Shamster. Saw that article & toyed with covering it. There’s little sense in making (anecdotal) comments like the homeopaths are reported as making in the article — to ‘counter’ the report they really need to provide evidence meeting section 5.4 of the ‘Effectiveness of Homeopathy for Clinical Conditions: Evaluation of the Evidence – Overview Report’* (p287). The evidence requirements pointed out there seem pretty basic requirements for evidence of this type, meaning the available evidence testing the claims of homeopathy can’t be up to a standard to draw sound conclusions from.